About Juan Pablo G. F.
Juan likes to play football and singing. In the school his favorite subject is Mathematics and his leas favorite is Spanish. He likes to go to school and he has a lot of friends. His temperament is regular and he has a good relationship with his family and friends. His favorite sport is Football. He would like to become in a “Soldier”. His dad’s doesn’t live with his. His mom’s name is Ramona; she is a single mother. She has an elementary school education. Her health is good and she works as an employee. 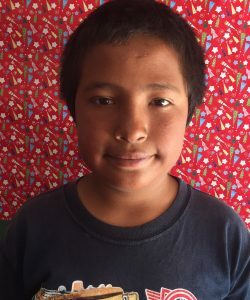 Juan shares his home with her mom, grandma and two siblings; Fernanda and Angel. Their home has a bath, kitchen and one bedroom with two full beds.